Located 40 minutes north of Seattle is the stunning AAA Four Diamond Tulalip Resort Casino where you’ll find a multitude of offerings, including luxurious accommodations, a rejuvenating spa, first-class entertainment, fine-dining restaurants, and impeccable service. This weekend getaway is right next to discounted designer shopping at the Seattle Premium Outlets. Seattleite was fortunate to stay and enjoy all that the Tulalip Resort Casino had to offer and we want to share it with you! 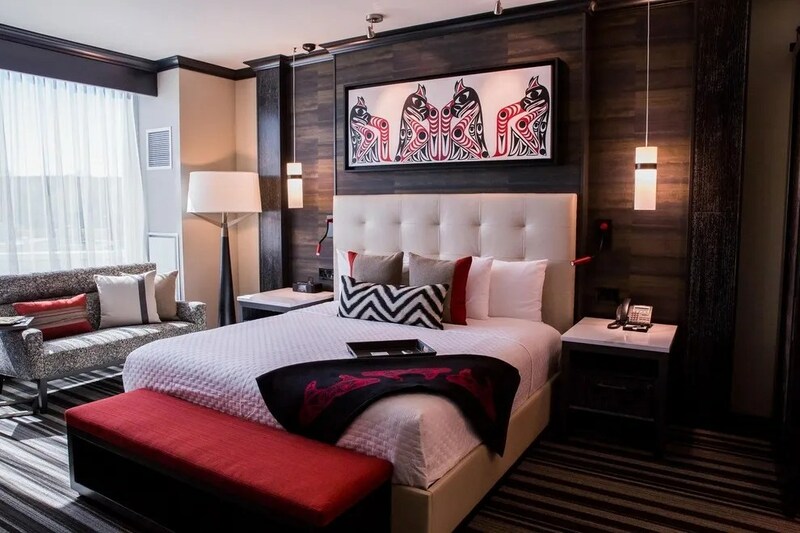 Tulalip Resort Casino has raised the bar with their exquisite guest room renovations. Currently in the process of updating all 370 rooms, they are nearing the end of the remodel. Luxury accommodations merge American Indian-inspired artistry with stylish and modern elegance. The resort’s style is attributed to the diverse history and culture of the Tulalip Tribe fused with new design, technology, comfort and luxury. Featured within the resort are vibrant Northwest Coast Salish artwork and textures visible in all the common areas and guest rooms. Inside the guest room, your attention will immediately fall to additions such as new 55-inch 4K OLED Smart TVs, in-room refrigerators, LED reading lamps, and no-fog mirrors. All rooms also have new heating and cooling controls, USB power outlets, and new furniture. User friendly technology includes Bluetooth enabled media hubs and a new instant access high-speed WIFI. These resort rooms are among the most spacious in the Pacific Northwest, with floor-to-ceiling windows, separate sitting area with comfy chaise lounge and fully stocked honor bar complete with Tulalip’s custom bottled wine. Tulalip Resort Casino presents the ideal location to balance mind, body, heart and spirit. The T Spa is a luxurious 14,000 sq. foot sanctuary, where guests indulge in stress relieving deep tissue massages as well as native-inspired spa rituals, body treatments and skin therapies. River rocks, wide bamboo floors, and serene candles, all contribute to the renewed feeling of inner peace and calm. Your spa experience isn’t complete without visiting the tranquil steam rooms, cedar dry saunas, or the rainfall showers. Guests can upgrade any spa experience by booking the VIP Services Suite from $40 and experience ultimate luxury. On-site amenities also include cardio equipment on the second floor and a luxurious, immaculate, covered Oasis Pool and whirlpool on the lobby floor. Guests can enjoy an immense amount of options to satisfy any appetite at one of the many resort dining establishments. If you are in the mood for fine dining, Tulalip Bay is a fine choice. This restaurant has a winning combination of a classic steakhouse meets traditional Italian food with an iconic, award-winning wine list. In the mood for a more traditional Tulalip seafood experience, Blackfish offers this and more. Blackfish offers a seafood centric menu paying tribute to regional Northwest ingredients and Tulalip tradition. Long a staple of the Tulalip Tribe dining, salmon is prepared using traditional tribal techniques over an open fire pit (diners can view this while dining). Blackfish’s upscale, vibrant atmosphere is reminiscent of a Tulalip Longhouse, which provides the perfect backdrop for the restaurant’s offerings. The Wine Spectator award-winning wine list includes over 900 bottles to indulge your taste buds. For quick service and a variety of options there is of course the Eagles Buffet that offers different food themes throughout the week. Near the hotel lobby Cedars Cafe stays open 24/7 and Destinations, their piano bar satisfies those craving for a quick bite and drink while listening to superb music and entertainment. Entertainment is one of the main missions of the Tulalip Resort Casino and here you will find a wide selection of slots, table games and an immense poker room. Gaming has long been a Tulalip tradition and the 192,000-square-foot casino hosts high rollers and casual players alike to participate in the gaming action. Visitors ages 21 and over can choose between table games that range from Blackjack and Ultimate Texas Hold’em to High Card Flush, Craps and Roulette. If gambling isn’t your thing, the Orca Ballroom is a popular entertainment venue and is becoming well known as a live comedy hot spot. Get up close seating to shows featuring national acts with an intimate 1,200 seating capacity. Past acts include Margaret Cho, Joe Rogan, Wayne Brady, Ron White, Amy Schumer, and Wanda Sykes. Nearby, the Tulalip Amphitheatre seats 3,000 people! It’s an outdoor venue that hosts many legendary national acts. Last summer some of the acts included Styx, Foreigner, Sammy Hagar, Diana Ross and many more. Stay tuned for the upcoming summer lineup for 2017! If you can’t wait for the summer and want to check out some of the entertainment Tulalip Resort Casino has to offer now the Canoes Cabaret stages live performers, dance lessons, movies and much more inside on the main casino floor. The atmosphere boasts a Las Vegas style lounge and bar and is open Tuesday through Sunday. Posted in Travel, Uncategorized, Weekend Wanderings and tagged Angela McWethy, Margaret Cho, Tulalip Casino, Weekend Wanderings. Bookmark the permalink.